College can already be a really stressful time, so the thought of getting an internship on top of that can be a bit daunting. How do you even find an internship? When should you start doing internships? How many? Ah. Today I'll be answering all of your questions about applying for internships and how to land your dream internship. If you have any questions that I don't answer in this post, please feel free to leave them in the comment section and I will definitely answer! 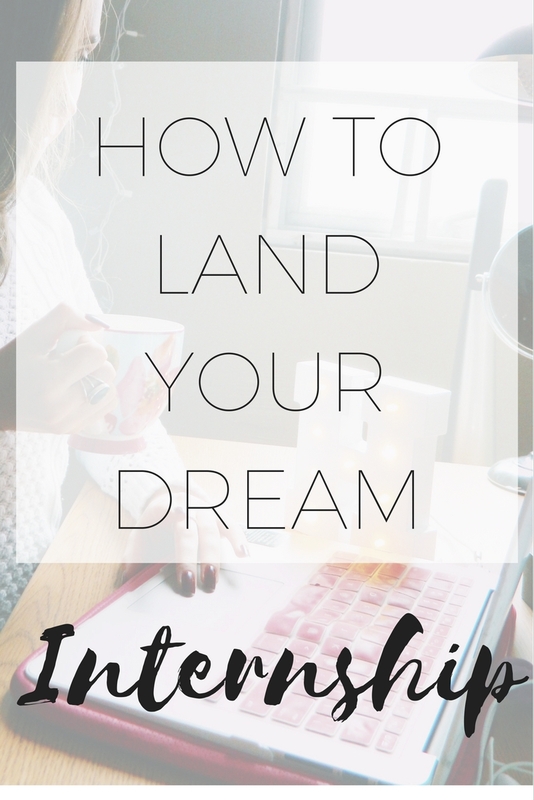 If you're reading this post, chances are you're already aware of what an internship is. I wanted to, however, start the post out by answering this question, since the idea of an "internship" can be a little confusing. An internship is basically a temporary "job" (I use the term "job" lightly though, and you'll see why). During an internship, you'll hopefully have the opportunity to work with professionals in your field and gain hands on experience that you don't typically get in the classroom. The reason I used the term "job" lightly is because some internships aren't paid. Personally, I'm not a huge fan of unpaid internships UNLESS you literally have zero experience, which is typically the case for those looking for their first internship. If you're just jumping into the intern world, taking one unpaid internship will definitely benefit you and make you much more qualified for a paid internship. What do I do before I start looking for an internship? Now, if this is your first internship, you won't have too much to include. Most college students have had some sort of part time or summer job, so definitely add that under the experience category. For example, I worked in retail for a few years in high school, so I added that to my experience section, and added "customer service", "communication skills", etc., to my skills/qualifications section, since those are related to customer service. You can also add any other expertise that you may have in the skills/qualifications section. There are plenty of templates online for resumes that you can use, so search the internet for a good template and get to work! With the whole online world now, applying for internships is actually really easy! I found my first two internships on the site Internships.com. It's really easy to use. You just simply upload a resume or create one on the site. I decided to enter my experience and such into the site since they already had a template that companies could easily view. You can also utilize Indeed.com, but just make sure to use the search term "internship". For both Internships.com and Indeed.com, you can enter your zip code to find internships near you. For me, I never have too many internships available near me, since I live in a very small town. The two internships I have done have been completely virtual, so I was able to do everything from home. How awesome is that?! This year, however, I'm looking to find an in-house internship, even if I do have a slightly longer commute then I would like. Companies love to advertise their internships on sites like this where they can receive a lot of applicants. Many colleges have resources for students in search of internships. The school typically has the information of companies that have taken on interns from that particular institution before. Your college itself is a great resource and connection for finding internships. Why should I get an internship? If you're in college, I promise you that no matter what you're studying, you absolutely need hands on experience. When you graduate, companies want to see that you've done more than just taken your classes and gotten a degree. They want to see that you've gotten out there and actually done some work that makes you qualified for a real job after college. As I said, an internship is going to give you actual experience in your field of study. Internships are awesome to add to your resume, and make it clear to employers that you're qualified for the position you're applying for. They're more fun than a summer job! I'm not going to lie, summer job type gigs that high school and college students typically find themselves taking are really, really not fun. An internship is going to give you a taste of life after college, and will allow you to hopefully put what you're learning in class to good use. Summer jobs are great for making some money over school break, but there was a point where I got really tired to summer jobs. Plus, they don't usually pay well. Hopefully in your internship, you'll get paid while you find yourself doing something that's going to benefit you in the future!